It’s here – summer! The onset of this sunny season gives us another opportunity to look at Ayurvedic tips on finding balance for ourselves in our ever-changing environment. I described Ayurveda in a previous Yoga Tree blog article on finding balance in the spring season, which you can read by clicking here. As a quick refresher, Ayurveda is an ancient healing tradition concerned with the achievement of holistic balance. The world is viewed through the lens of three types of energies: vata (air + ether), pitta (fire + water), and kapha (earth + water). Each of these three energies has its own characteristics, and each individual has their own unique composition of these elements, which combine to create their dosha, or personal constitution. Summer, with its bright, hot, and intense days, is the season of pitta. Individuals who have a primarily pitta dosha may dread this season as the increased heat may make them feel physically uncomfortable, and should watch for other signs of excess pitta, such as rashes, inflammation in the body, anger, judgment, and perfectionist tendencies. 1. Eat lighter and smaller meals, and include lots of sweet, bitter, and astringent-tasting foods that are cool, liquid, or slightly oily. Summer is a great time for eating fresh fruit and salads, so now is a great time to try out any raw recipes you’ve had your eye on! 2. Avoid eating too much spicy food, such as dishes that contain chilis or lots of cayenne pepper. On the other hand, Ayurveda recommends ice cream, so go ahead and indulge those cravings this summer! Be careful about overconsuming cool treats though, as this can disrupt the necessary fire energy needed for healthy digestion. 3. Mint, lime, licorice, fennel, and rose are excellent to add to your diet in the form of infused water or tea. However, adding ice to your beverages is considered inadvisable in Ayurveda, because ice is too disruptive to the digestive fire. 4. Dress lightly, in both fabric (such as cotton or silk) and colour (such as white, blues, purples, greens, and greys). 5. Lie on your right side at night so that your left nostril, which contains your lunar pathway, can be free and open. Lunar energy is calming and cooling, and helps balance solar energy, which we get plenty of in the summer. 6. Get out of bed earlier in the mornings, which is naturally easier when it is lighter outside anyway! On the hottest days, allow yourself to take a nap mid-afternoon if you feel your energy start to dip. Don’t stay up later than 10 or 11 pm, as this may leave you feeling overstimulated. 7. Exercise in the morning, and at 50-70% of your full capacity. Pushing too hard in any activity and exercising outside during the hottest times of the day (10 AM – 2 PM) is not advised during this season. 8. Include cooling and soothing poses as well as poses that focus on the abdominals in your yoga practice, as the solar plexus is where our bodies hold heat. 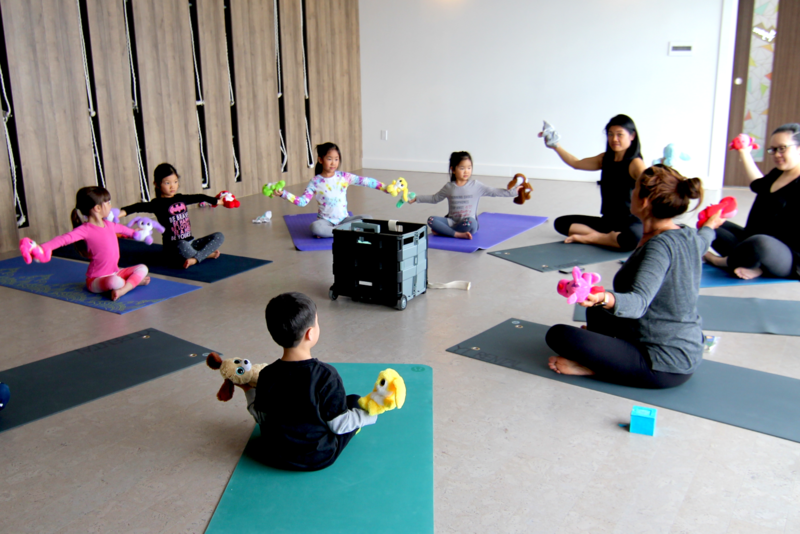 Child’s pose and forward folds are good for cooling and soothing the body, whereas cat-cow, cobra, boat, side-openers, and twists will target the abdominal area. 9. Approach your yoga practice gently. Yin and restorative classes are good to attend in the summer months, but it is important that, even in more intense classes, you make sure you are not straining. Move in a flowing manner, and keep your breathing and gaze soft and stable. 10. Moon salutations are an alternative variation to sun salutations and are highly recommended during summer months, again because lunar energy helps balance solar energy. To read more about finding balance in summer and to view dosha-specific suggestions for the summer season, read more from Banyan Botanicals’ summer guide by clicking here. You can take quizzes online to get a sense of your constitution and current imbalances, such as those found at https://www.banyanbotanicals.com/info/prakriti-quiz and http://www.banyanbotanicals.com/info/vikriti-quiz respectively. If you are interested in going more in-depth, you can also seek out a trained Ayurvedic practitioner. Enjoy the rest of this gorgeous season! Information in this article was summarized from http://www.banyanbotanicals.com/.